Rep. Jim McDermott’s aide, David Loud, read a letter from the lawmaker hailing Parry as a leader of the fight for comprehensive, universal health care reform. “We are indebted to you for your years of service,” McDermott wrote. Ed Coyle, executive director of the Alliance of Retired Americans, brought greetings from ARA headquarters in Washington. He said the staff waits for the arrival of the PSARA’s newsletter, the Retiree Advocate, edited by Parry. He praised Parry as a national leader of the senior citizen movement. Parry’s family was there, including his daughter Naomi, his son Jon and his brother Tom who told the crowd of their childhood and youth together, Will’s years in the U.S. Coast Guard during World War II and his excellence as a high school and college scholar and athlete. Jeff Johnson, assistant to the president of the Washington State Labor Council, spoke of Parry’s affiliation with the Communist Party of Washington State, the Pension Union and the Washington Commonwealth Federation that “became so strong they elected a Communist to the legislature” during the 1940s. 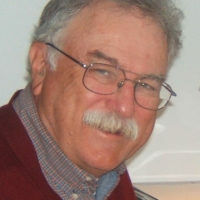 In recent years, the Washington Labor Council “honored him as a hero of the Washington State labor movement,” Johnson concluded. Thurston Muskelly, board member of the Central Area Senior Center, praised Parry for his fightback against President Reagan’s drive to “destroy public health.” The center was facing bankruptcy and Parry spearheaded a fund drive that brought in $131,000. Ron McGaha, a member of Machinists Local 751, recited a poem he wrote about Parry: “On his very first night, he rose up in bed and to his mother he said, ‘I’ll nurse from the left, not from the right’ … Will taught us all in ways great and small, that progress always comes from the left, not the right.” The room erupted in laughter and cheers. 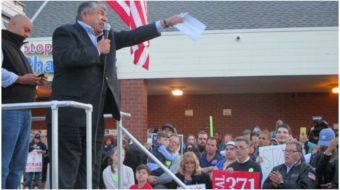 With his guitar slung over his shoulder, Parry thanked the crowd and echoed the appeal to get enough signatures to put the State Income Tax initiative on the ballot.